You can't research everything, or you'd never have time to write. There's a lot you're going to create out of whole cloth, and sometimes it's appropriate just to wing it. When you do this depends on the needs of your story, and on what you can realistically do. I've written entire books that required no specific research at all, and others that took a good deal of it. There will be times when you just can't do all the research you'd like. One friend of mine wrote a book set partly in Russia. While he might have liked to travel to Russia to check out the setting, it wasn't practical for him to do that. So he read up on the subject, then depended on his writing skills to make his scenes feel real to the reader. So how do you write a scene when you don't have a lot of hard information? You start by giving your imagination free rein, and trying to picture the scene in as much detail as possible. You're a magician creating an illusion. Start writing, and think out loud (or on the page). Draw from your experiences in other, perhaps similar, settings. 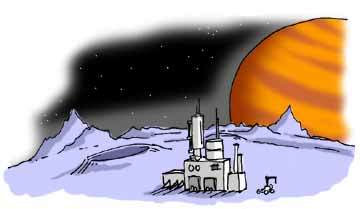 I once wrote a scene about a strip mine on Triton, moon of Neptune. I had basic information about the surface of Triton, as gleaned from the Voyager spacecraft (and this is a case where I consulted with an expert on details I needed to know), but no one has ever done any mining on Triton, or even set foot there. On the other hand, I had been in industrial settings; when I was in college, I worked summers on an automotive assembly line. That experience gave me a feel for the sights and sounds and smells of an industrial workplace, and for the strange-looking machinery that people operate. So I made up some mining equipment and the look and feel of the operation. The specifics of how it worked weren't critical to the story; what was critical was ensuring that the reader would feel that it was real. And by all accounts I've heard so far, I succeeded. You can decide, too, the amount of detail you want in your scene. If you're retelling a fairy tale, you might describe very little, depending on the reader's knowledge and expectations of fairy tales. On the other hand, you might want a sense of clear, gritty realism, and in that case  one way or another  you must provide concrete detail. In a way you research everything, whether consciously or not. If you're an inquisitive person, a lot of your research takes place as a matter of daily routine  as you read newspapers, books, and magazines; as you interact with people and learn more and more about human relations; as you surf the Web; as you think about the kinds of stories you see on TV and in the movies (not just watching, but thinking, mind you). And speaking of TV, don't neglect the often excellent science, history, and arts programming available  from PBS to the Discovery and History channels. To a writer, life is research, and everything you do becomes a part of your lifelong learning project. Learning becomes an ingrained habit; it becomes something you hunger for, something you look for at every turn. It's one of the reasons you get out of bed in the morning. It's addictive. Most addictions are bad. But here's one you can succumb to with a clear conscience.